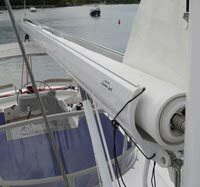 Mike Dwight January 6, 2016 No Comments on Respected Sailing World Spokesperson John Kretschmer Comments on Forespar’s Whisker Poles. Category: Forespar Products in Use, Uncategorized. There’s a place for rock and roll and it’s not on an anchored boat. 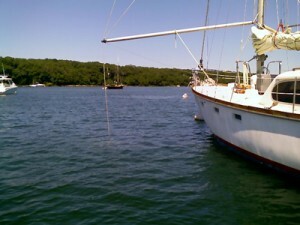 Salt water boaters often find themselves anchored or on a mooring. There’s a swell, a surge from the swell or just enough breeze to create some waves, all just enough to rock the boat. That rock can be strong enough to be uncomfortable. It is hard to sleep with a grip on the mattress, and an evening on the deck or in the cockpit isn’t very comfortable. A flopper stopper is the solution. I’ve tried several types over the years, and settled on one that works across the board – the Roll-X™ from Forespar. The same system has dampened the roll quite well on my power boats (a Grand Banks 42 and a 28’ Wellcraft) and my sail boats (a Baltic 52, and a Soverel 33), as well as other vessels. 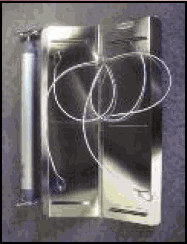 The Roll-X stabilizer consists of two stainless plates, about 12.5 by 40 inches, hinged together, and supported by a single line attached to a basic harness. It works simply. On the down roll, the unit folds together on the hinges, and drops deeper. 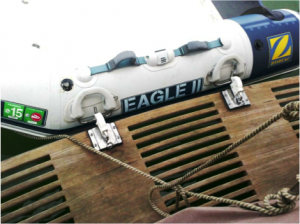 On the up roll it unfolds, creating about seven square feet of resistance – sufficient to dampen a dramatic roll, completely quash a smaller wake or wind wave. And, the Roll-X has winglets to minimize the “skate” fore and aft while down, making the ride even more. Roll-X stabilizer is most efficient when used with a pole to increase the leverage (one comes with the kit). 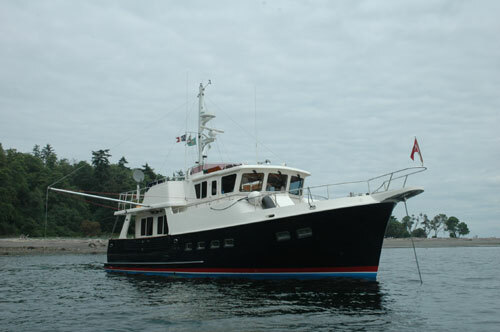 You can see how on the trawler below. 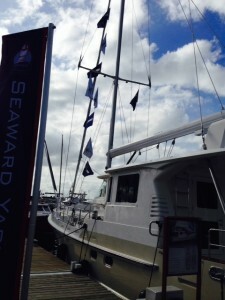 Many sailors use the poles they’ve already got – spinnaker pole, a heavy whisker pole and often the boom. Swing it out on a halyard or topping lift, and couple of lines for guys and the crew is going enjoy a lot more stable time at anchor. Candidly, the Roll-X stabilizer works pretty well as a flopper stopper with no poles, although using two (one on each side) helps make up for the lack of leverage. They are simply lowered over the side, down six or eight feet, and made fast to the cleats nearest the beam of the boat. Yes, we were in a hurry, or just too lazy to rig properly. They do work better poled out, and you must be sure to hoist the stabilizers in before weighing anchor and sailing away. You can be sure that you’ll be well rested because you’ve experienced a lot less rock and roll. Mike Dwight December 2, 2014 Category: Forespar Products in Use, General Content. 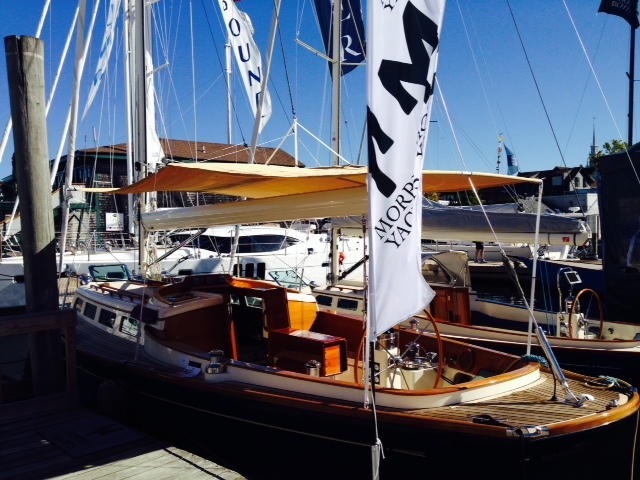 Forespar’s Leisure Furl in-boom furling and reefing system is being displayed at the Newport International Boatshow which opens today in historic Newport, Rhode Island. Four boats equipped with Forespar’s Leisure Furl are being displayed plus the Forespar booth has a working display to see and examine. 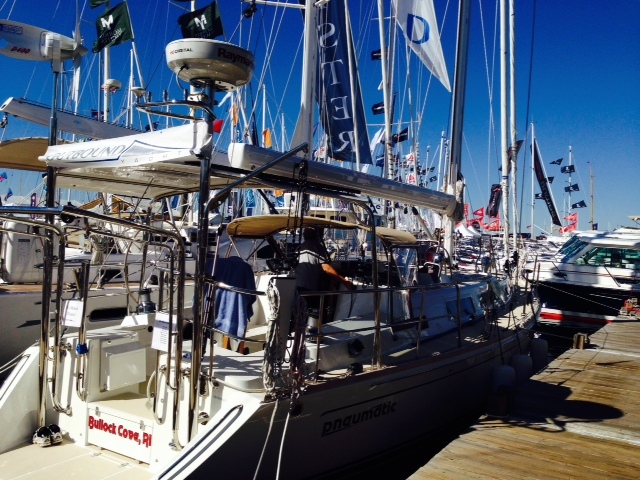 The boatshow runs today through Sunday, September 14. 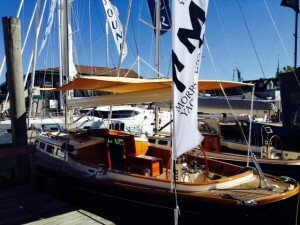 Forespar’s is introducing its’ new Leisure Furl Voyagers group at this year’s Annapolis Boatshow. 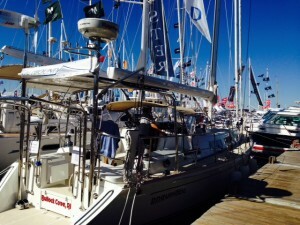 The show runs October 9 – 13 and is the largest sailboat show in the USA. The Leisure Furl Voyagers celebrate those most actively sailing their Leisure Furl equipped yachts. With various mileage award levels from 1,000 miles sailed to over 25,000 miles, the Leisure Furl Voyagers celebrate Leisure Furl sailors of all experience levels. Join us at the Forespar booth in Tent C to find out more or email Alan Massey a t alanm@forespar.com for more information. Mike Dwight September 14, 2014 Category: Forespar Products in Use.